The strategy seems to be more about competing with China than benefiting African countries. 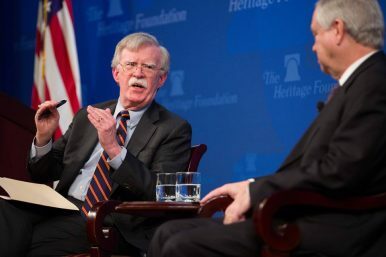 U.S. National Security Advisor John Bolton recently unveiled the Trump administration’s new Africa strategy in a speech at the conservative Heritage Foundation. In addition to announcing a new approach of engaging with African development, the most headline-grabbing part of Bolton’s remarks is his accusation against China for “predatory practices” on the continent. Bolton mentioned China 17 times through the speech, during which he enumerated Chinese “sins” in Africa and declared that the overriding target of the U.S. strategy is to counter Chinese influence across the continent. Combative as Bolton’s words are, the speech contains nothing novel. Before Bolton, U.S. Vice President Mike Pence had pointed the finger against Chinese aid and investment in front of a group of business and political leaders at the APEC CEO summit just a few weeks ago. On that occasion Pence used language similar to Bolton’s to denounce Chinese funding, calling it opaque, poor quality, and a source of debt. Certainly, it is no secret that the Chinese aid budget has skyrocketed in the past decade. It has been revealed that Chinese spending on development cooperation between 2000 and 2014 could almost rival that of the United States, although most Chinese development funds were provided in the form of loans and, strictly speaking, aid to its developing partners remained modest. China’s booming aid has raised global attention and the country has been tagged with terms like “neocolonialist” and “rogue donor.” Despite these negative images, Chinese aid might be not as evil as often assumed. A number of rigorous studies — which were notably absent in Pence and Bolton’s accusations — have demonstrated that Chinese aid is fairly positive in facilitating the development of recipient nations. For example, a report by the African Development Bank Group in 2011 concludes that Chinese engagement with Africa can be beneficial both to China and to African countries. A study by AidData at the Virginia-based College of William and Mary in 2017 found that Chinese aid is effective in boosting economic growth in recipient countries and does not impair the effectiveness of grants and loans from Western givers. So, why is the Trump administration so hostile toward the Chinese presence in Africa? This, in the first place, should be understood in the context of Trump’s foreign policy doctrine. In what he brands as “principled realism,” the central role of power in world affairs is highlighted. In Trump’s mind, an era of “great power competition” has arrived (or returned) and the United States has to compete with its rivals, particularly China, in a variety of areas, including aid. Therefore, although Trump was notoriously critical toward aid and repeatedly threatened to slash the aid budget, it seems he has changed his mind. Trump’s administration started to embrace aid by ratifying the establishment of the U.S. International Development Finance Corporation (USIDFC) in October, which holds the authority to provide as much as $60 billion to assist U.S. companies willing to do business in developing countries. Reportedly, that shift on aid is attributed to China — advocates of USIDFC had been pitching the idea since 2015, but finally got the green light from White House only after turning its focus to China. Therefore, it is no surprise that the creation of the USIDFC was interpreted as “satisf[ying] an imperative of the U.S. presidency to counter China’s ‘debt diplomacy’.” In the same vein, the administration’s new Africa strategy adds a new weapon to Trump’s arsenal to fight an influence war with China. But obvious question is what this new strategy means for its targeted region. Will Trump’s sort of zero-sum and rivalry-based thinking eventually help the African nations eliminate poverty? When America is put first in aid, where are the developing recipient countries? If the United States genuinely wants to help Africa prosper, as claimed by Bolton, it should engage with other donors at play, including China. In the aid realm, no single actor can do everything, must less do everything perfectly. Mutual learning, coordination, and collaboration between donors are always key to a more effective and sustainable development — and thus a prosperous Africa. Zhang Chao is an Assistant Researcher at the Institute of European Studies, Chinese Academy of Social Sciences.